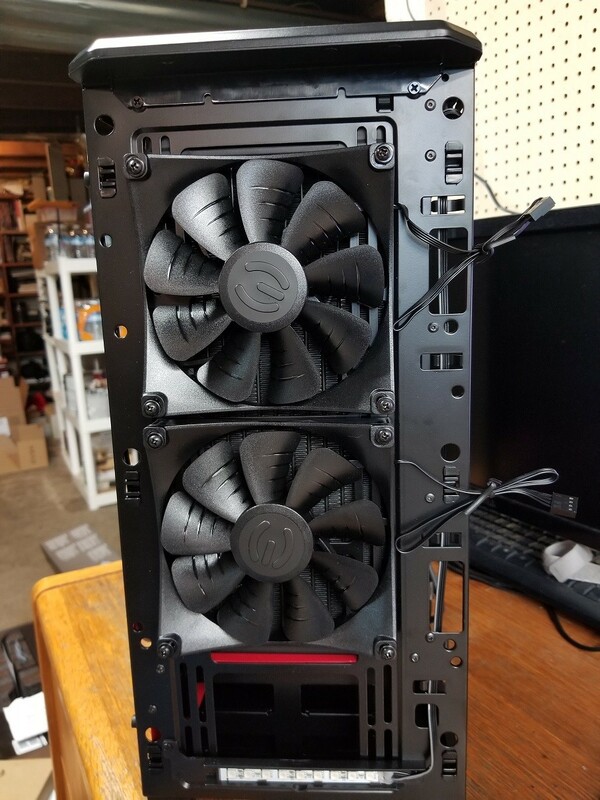 Final parts have been purchased for the new build. 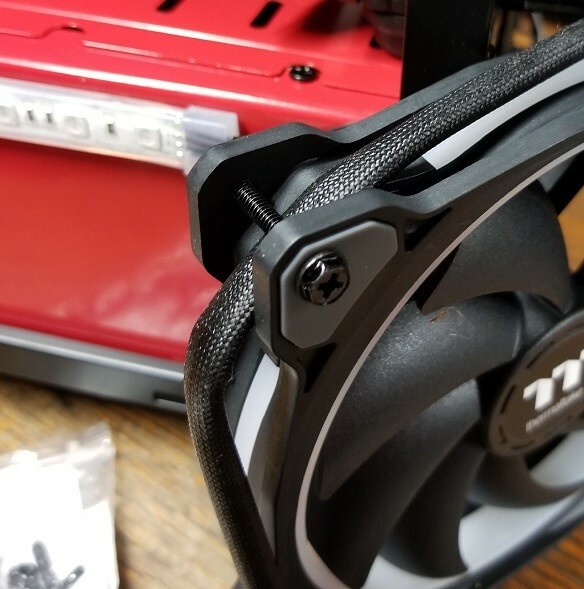 (1) M.2 fan mount from ASUS 3D printed mounts: 3D printed M.2 fan mount: Red Strong & Flexible Polished: Pinkish red, richly colored nylon plastic with a smooth finish. PSU - The EVGA Super Nova 850 G3 80 Plus Gold, Fully Modular PSU. 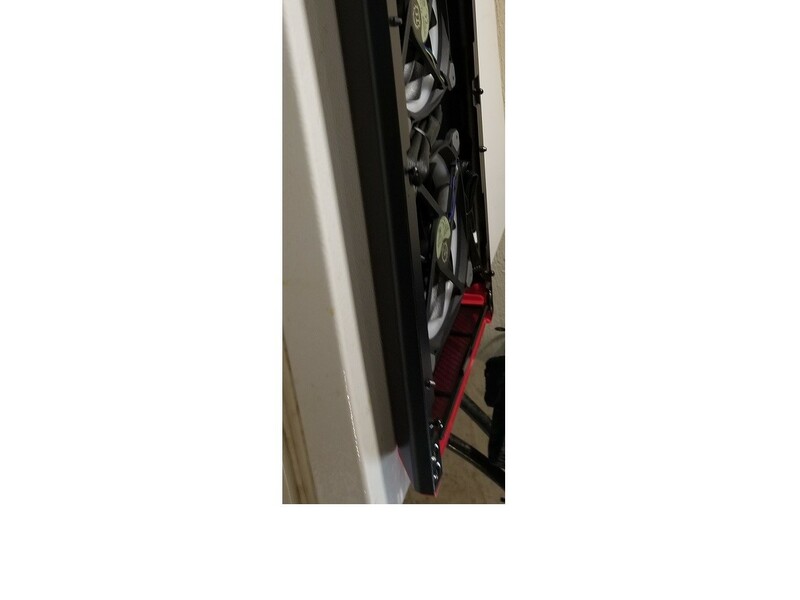 (1) Replacement set of ModMesh CableMod? 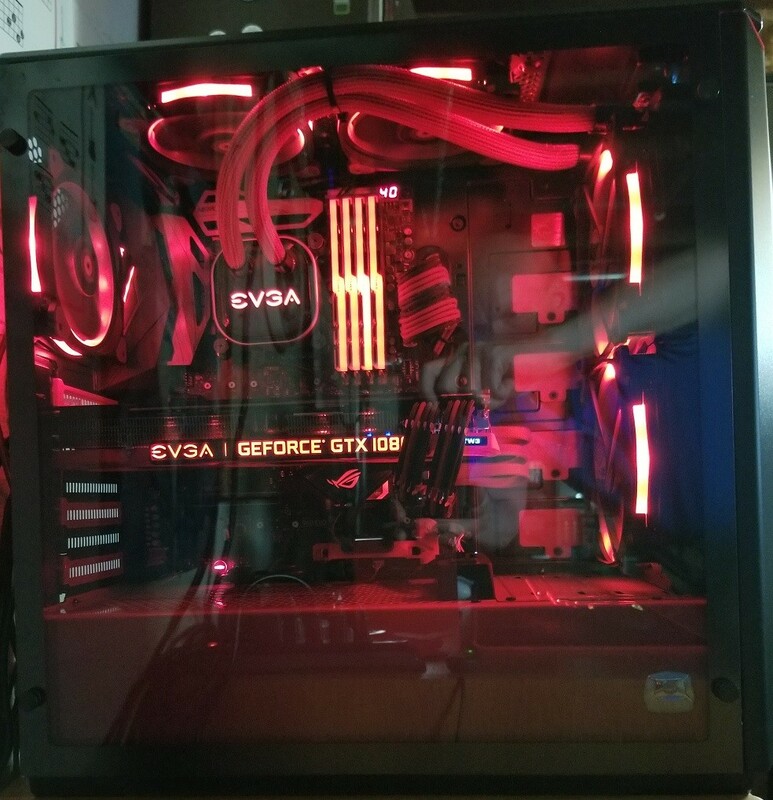 cables, in Black and Blood Red made for my PSU. 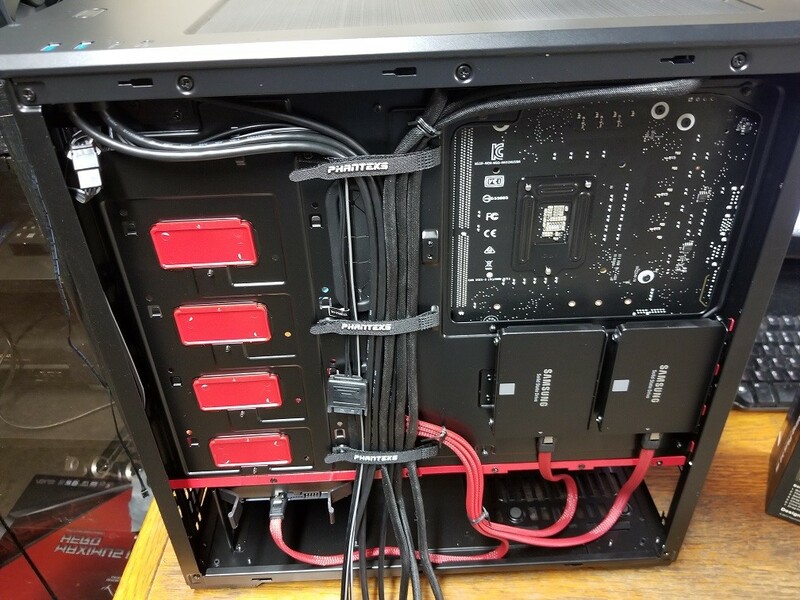 (4) of the CableMod? 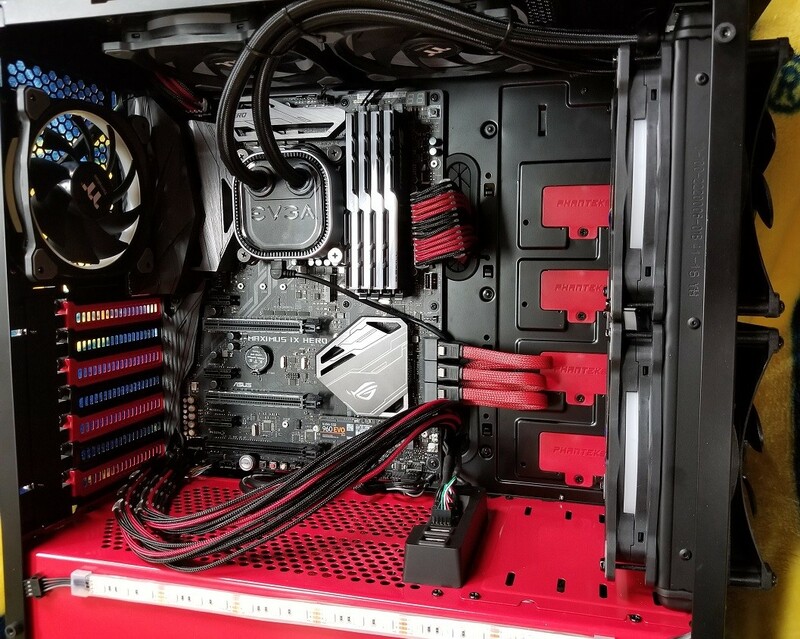 24" SATA 3.0 data cables in Blood Red. 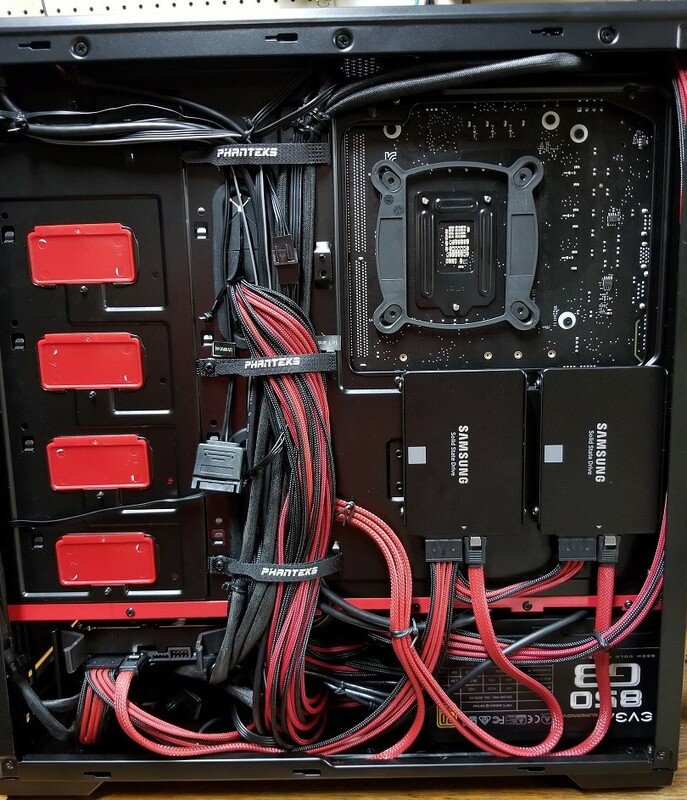 (1) Set of CableMod? 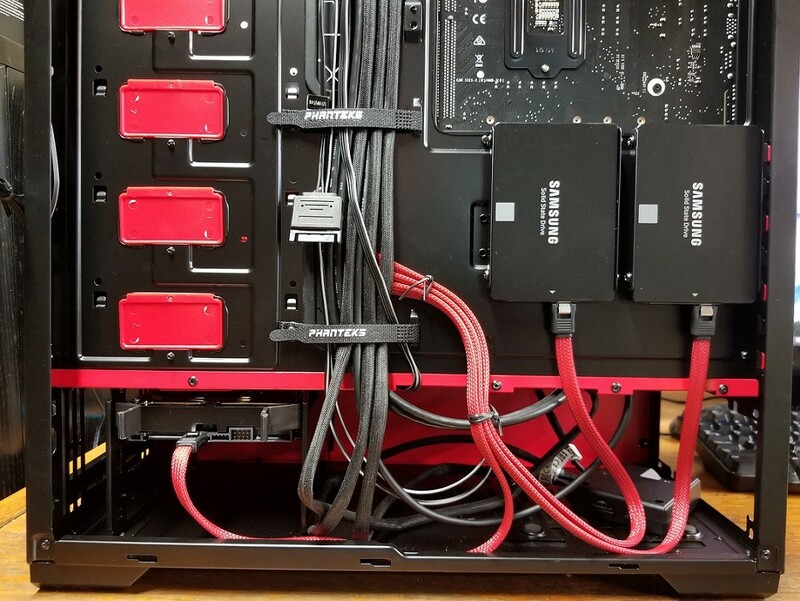 Cable Combs, made for the ModMesh cables. 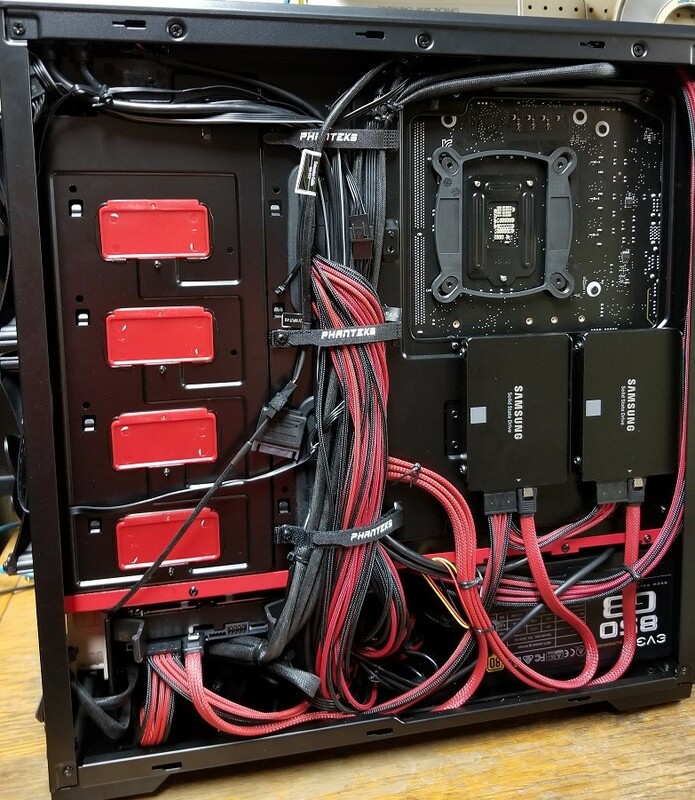 (1) CableMod? Addressable LED Strip ? RGB: that is compatible with ASUS Aura Sync. She should be a runner!! I believe that I will have enough space, to run two 140mm fans outside the case, and under the front cover. This is the front cover with two 140's sitting in it, just ensuring that I would have some fan clearance. I still have some good room going, for adding my second set of 140mm fans, to be attached to the inside of the RAD... Sweet! 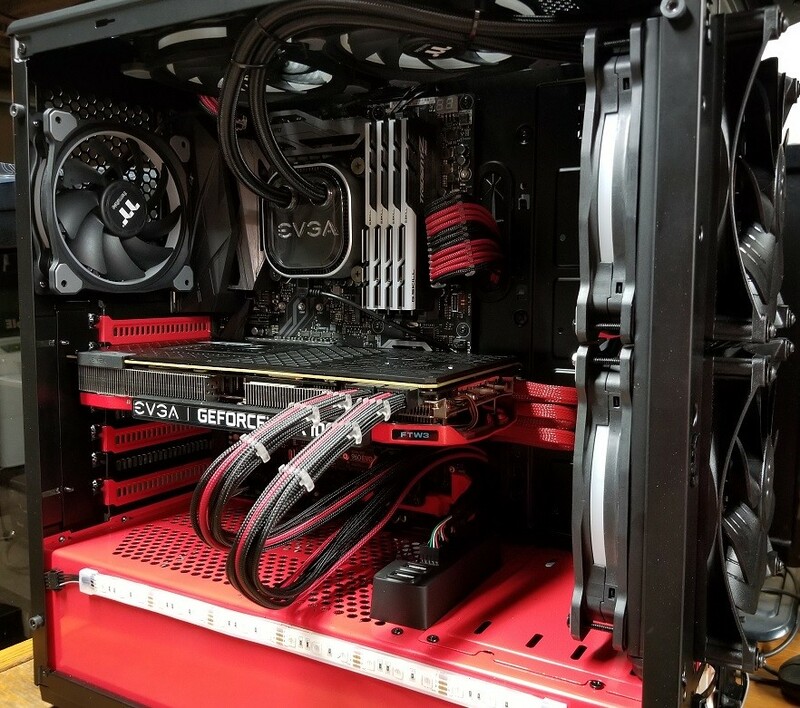 I did finish up on hooking up the case wires. 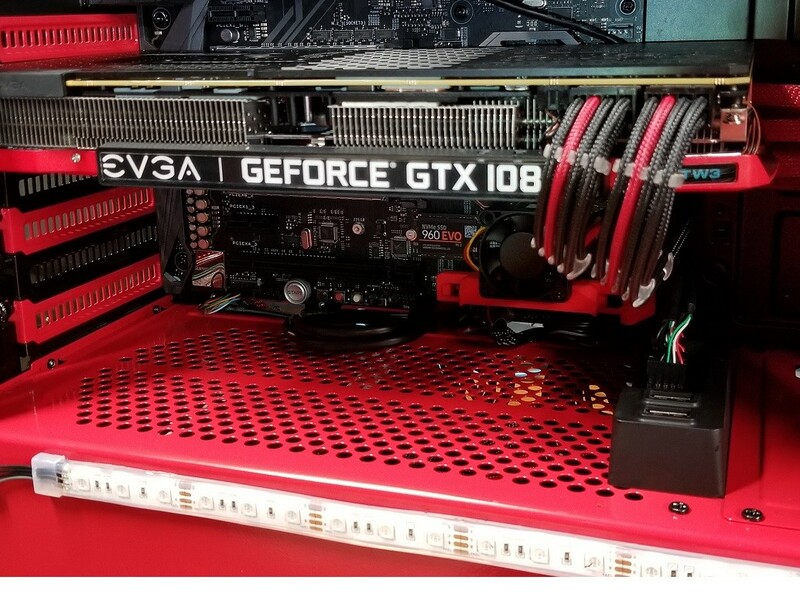 I am waiting on my 8 Official EVGA fan mounting screws, that fit in my EVGA RAD. Customer Service was sending me some out a few days ago, so there should be here soon. 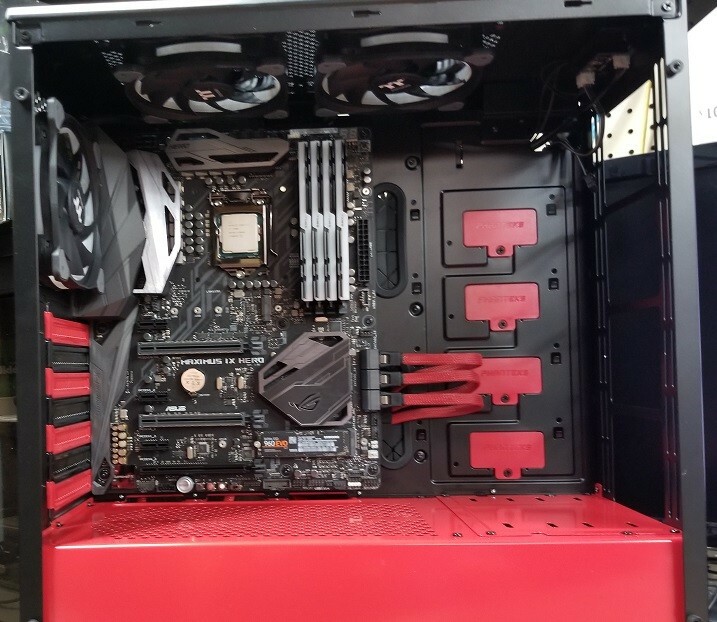 It has my thermaltake RGB fan controller, waiting to accept it's last 2 fans. The 2 140's. That controller can take up to 5 fans, and I will be filling er up! 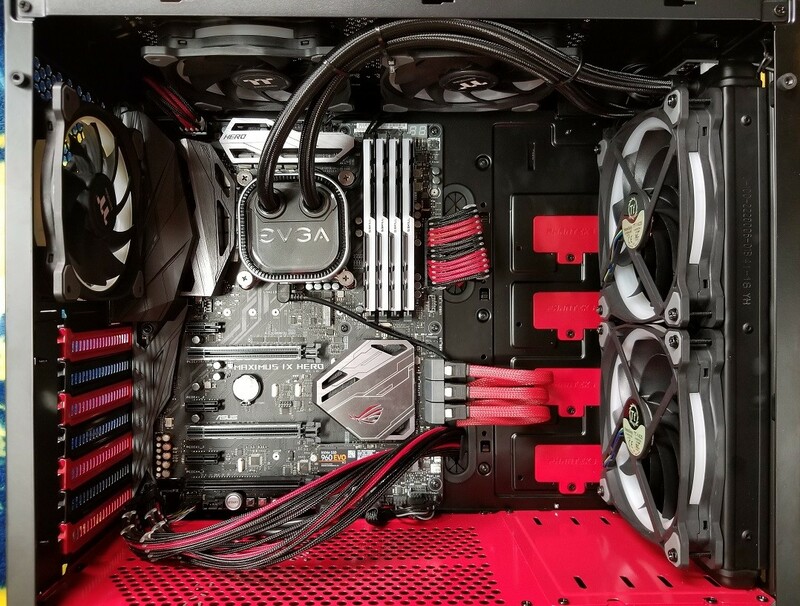 I think the thermaltake fan controlling software, looks like one of the best currently out. All 5 of my RGB fans will be running in sync. (3) 120's and (2) 140's... Should look decent. I bought (1) Phanteks RGB LED 4 Pin Adapter, Specified for Cases with Multi Colors RGB Control (PH-CB_RGB4P) $5.00 from Amazon. I did 2 things for me. 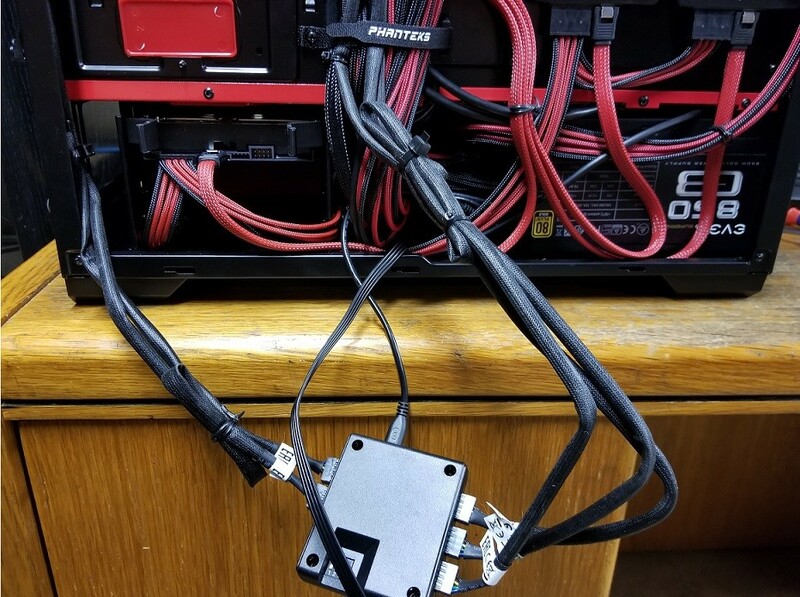 1 - It's primary function, to allow the case to be powered from an RGB header from your Motherboard (Not the molex connector hanging on the back of my case...). 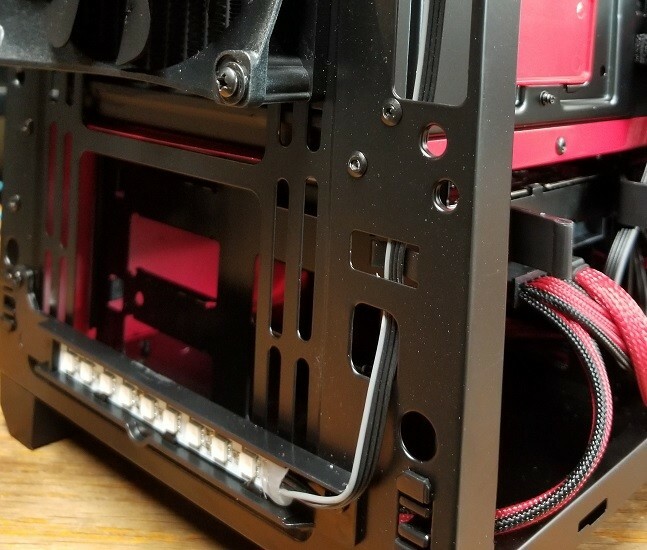 The RGB light strip that is included with this case is a looker, but does not have enough length to be placed dead balls even in the center of the window. You will be about an inch or two short, after going around the frame with the power wire. After plugging this adapter in, it ends up giving you the extra slack required to put your RGB light strip, in mathematical center of the window. I just ordered (1) Noctua 60x25mm A-Series Blades with AAO Frame, SSO2 Bearing Premium Fan - Retail Cooling NF-A6x25 FLX (3-pin connector. I also was talking to some of my gaming friends, and the word is that they all use gaming headsets, and talk during the game. Well I wanted in too so I ordered The ASTRO Gaming A40 TR Gaming Headset for Xbox One, PS4, PC ? in Black. 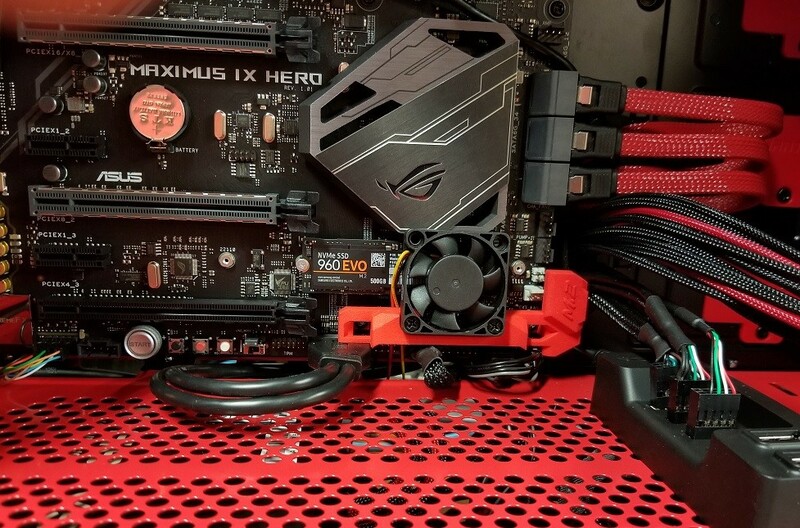 Let's hope my ASUS ROG Maximus IX Hero Z270 Motherboard is up for the task! any reason why you didn't wait a little longer for the new CPUs to come out ? Yes, wanted to build now, convinced the the 7700K will be the best gaming CPU for a few years. By then I will want Cannon lake with faster PCIe lanes, and DDR5. 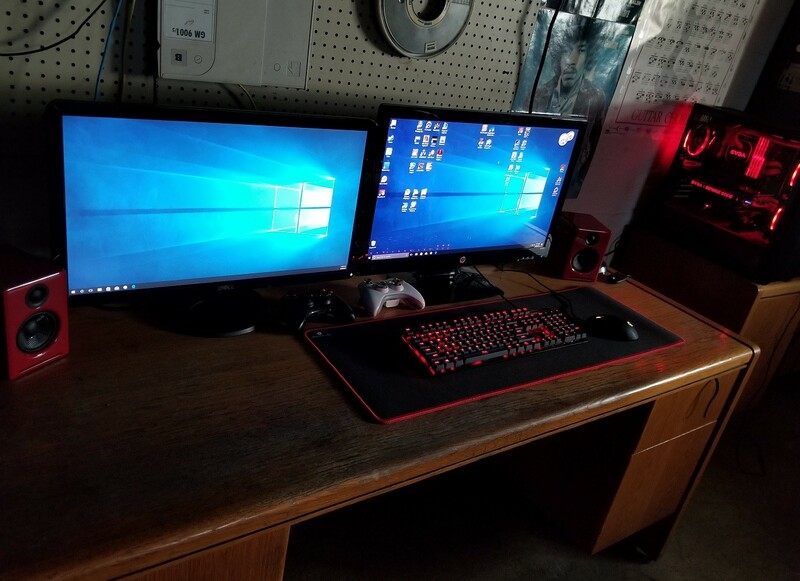 This is strictly a gaming rig. Well guess what? I just used my fingers to thread them into the RAD, and with little pressure, the were going right in. 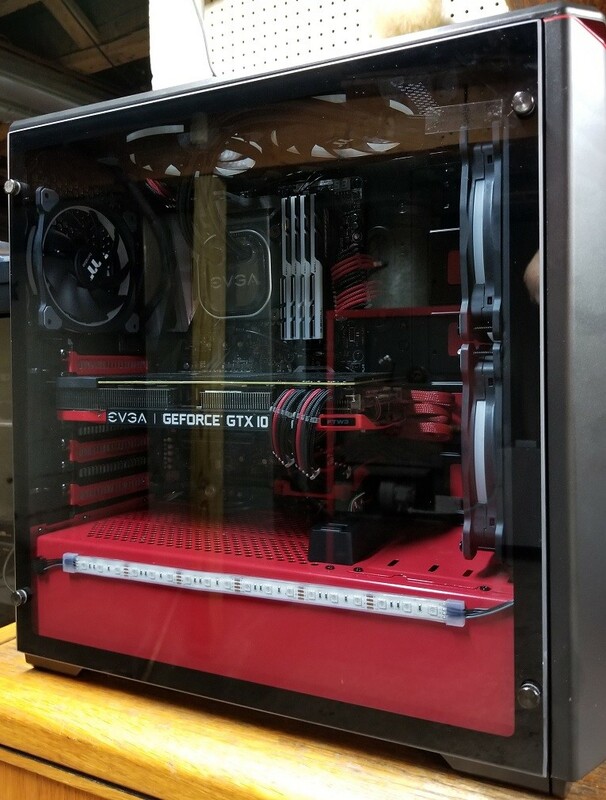 They do in fact have the correct threads to fit in the EVGA CLC 280's RAD. I also did a test where as soon as the screw would grab it's first threading on the RAD, I would count how many full rotations until contact was made with the RAD fins. It was 7 full turns. If you were to go 8, you would be doing damage to the RAD. 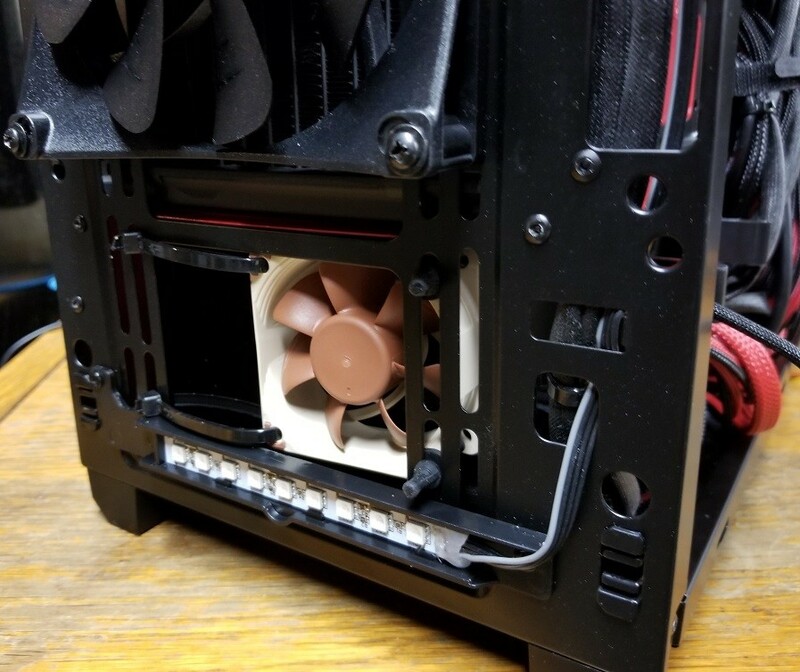 I needed this info as I would not be able to see the screw, once the fans were put in their mounting position. I was not going to turn any of the screws over 7 full turns. 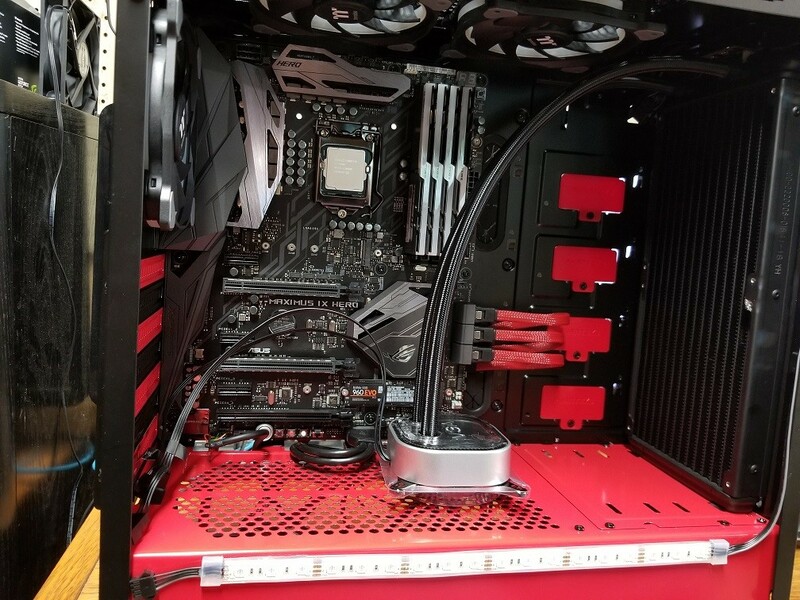 I actually ran the wire for the lower fan like in the picture, but also continued to run it's wire into the upper fan, also putting it inside the screws guides. I first sent both of their remaining fan leads out the top of the case. Using my fingers, started each screw in to the RAD where it just began to have the teeth bite. Got my screwdriver out and began counting until the fans firmed up. 5 full turns. Wonder-full!!! I am happy with 5. I knew after 7 full turns would cause damage to the RAD's fins. These screws are 100% correct for this RAD. 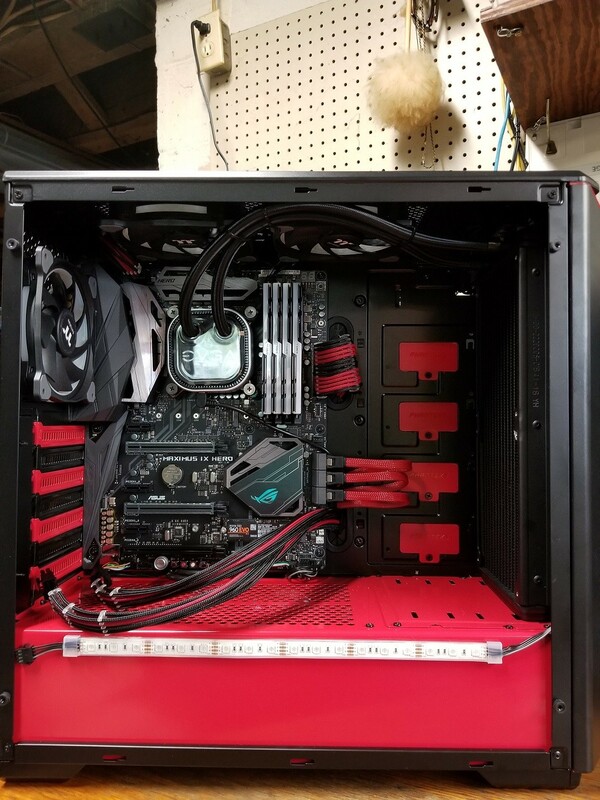 Cant even see the fan wires... Sweet! Well my Fan controller was now full with 5 fans. It also pushed me into needing a USB 2.0 Hub. 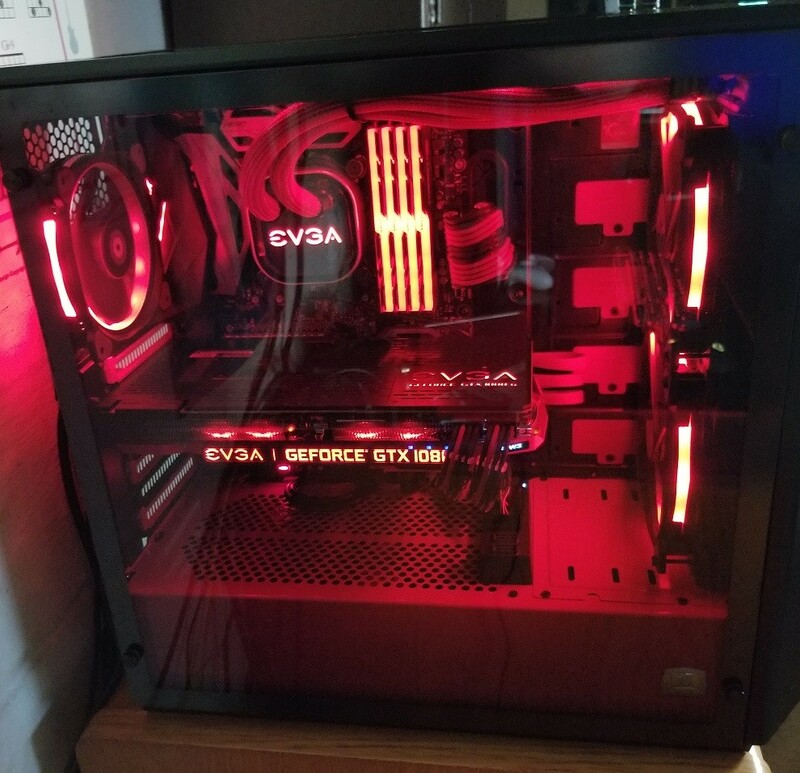 I broke out the NZXT. 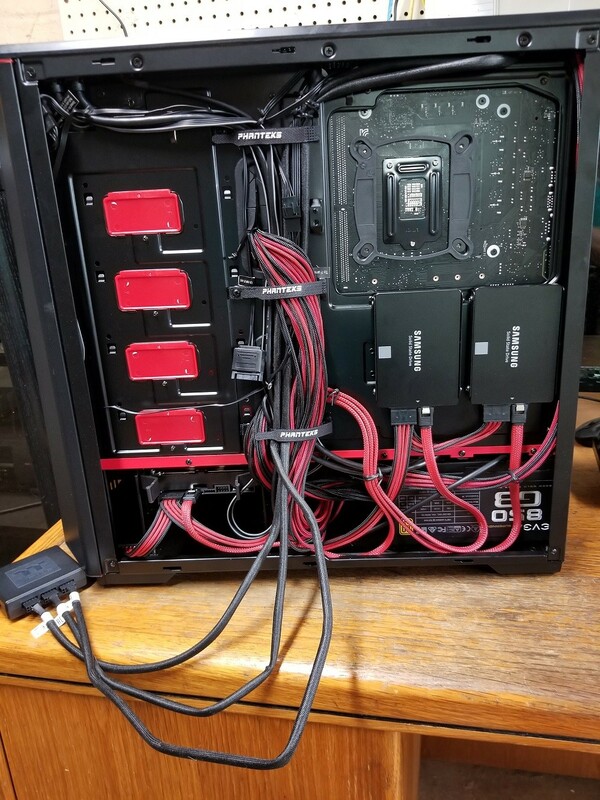 Well looking at this monstrosity, I had to start coming up with a plan to house this amount of wires. I opted to place the USB Hub up in front of the case, to actually save some room in the back. It has a magnetic base, so it sticks in place very well. I am not real proud of it, and it it proves to rattle or cause any issues, I will take it out. But so far, it has convinced me that it can hang in there for a while, so I am going to give it a try. 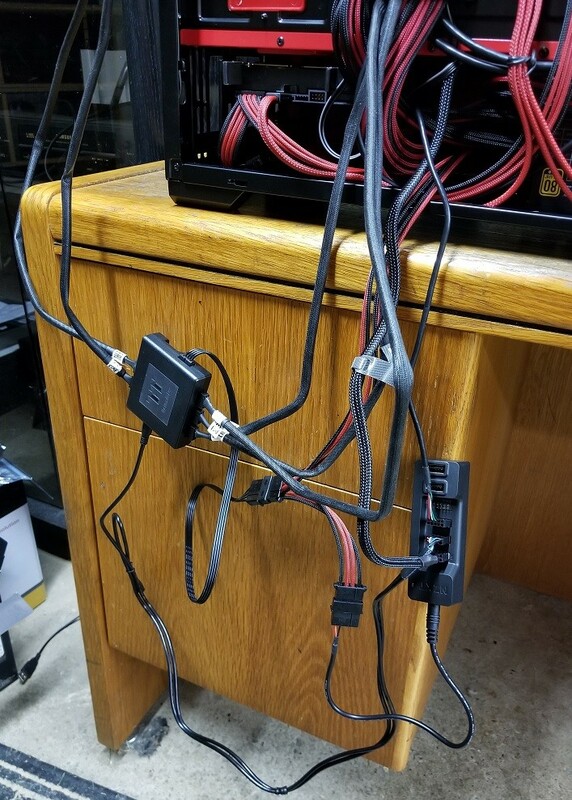 I folded my fan wires up as small as possible, and then was able to fit the wires, and controller under my hard drive tray. 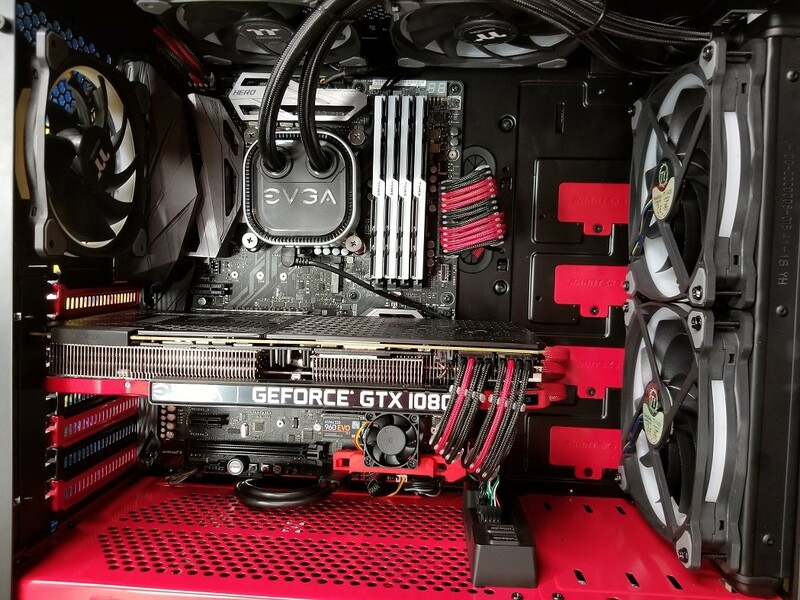 And finally, the main event, installed the GPU!!! It might be too bright. Last edited by Talonman; 08-13-2017 at 05:28 AM. And a wide angle of my cold Ohio basement, where the PC enjoys about 65 degree air all the time. So far I'm loving it. Huntington has already shut my Master Card off twice in the last week for downloading games from Steam. Too many transactions, triggered the fraud alert. 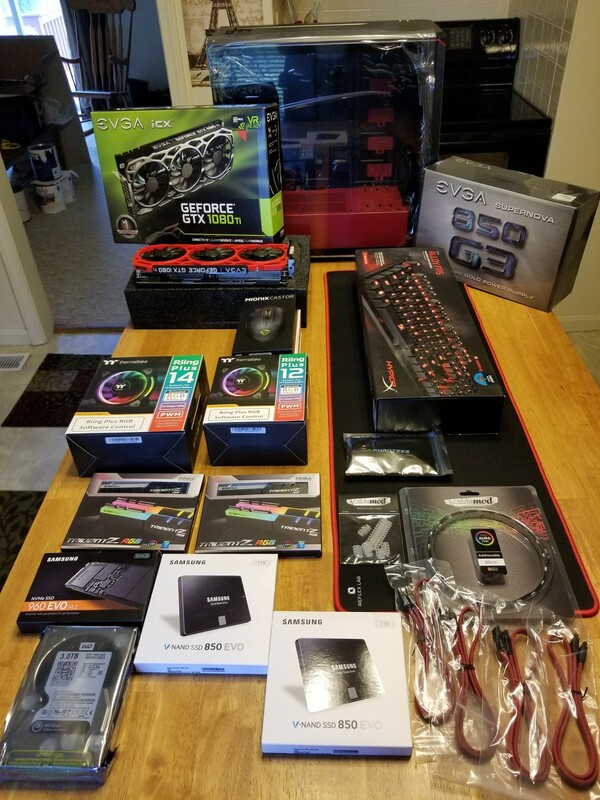 I told the bank after my first call, that I just built a new gaming system, and was downloading some new games. After the second time, they told me that no human read the notes on my account. It was a computer who shut my card off twice in one week. It is back on again and working fine. 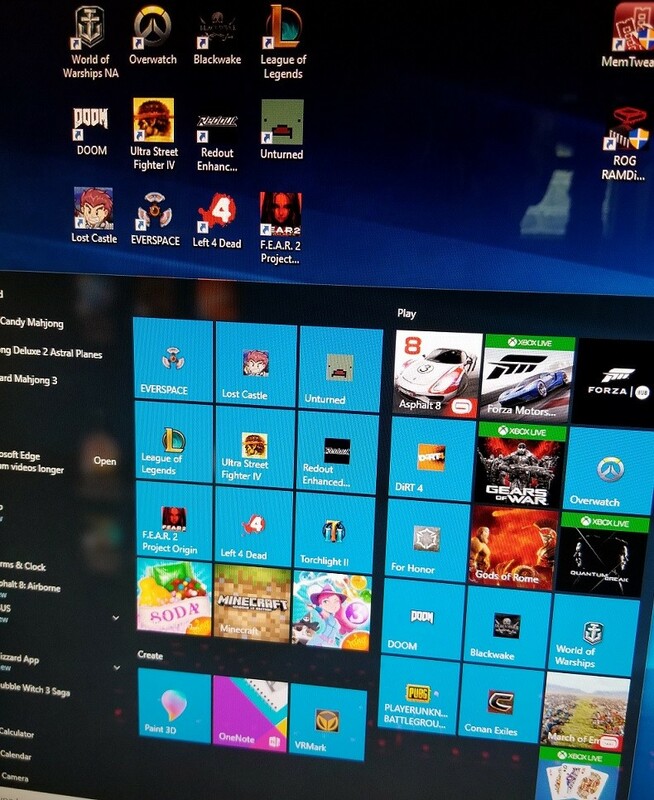 I was happy on how many of my older games installed just fine on Windows 10. I took this screen show a few days ago.... before all my games were installed. I now have 70 Games installed, and it is just taking up 50% of my 2TB RAID array storage. Last edited by Talonman; 08-24-2017 at 09:12 PM.